SIBU: The RV Orient Pandaw is sailing up the Rajang River for the last time. The 827-tonne, 30-cabin river cruise ship departed from here yesterday evening to Kapit for its last nine-day, eight-night “Into The Heart of Borneo” cruise. 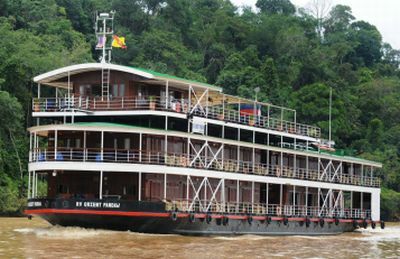 After this, the steamship would be sent to Myanmar where it would be chartered by an Australian tour company for the next three years to cruise along the Mekong River. Owned by the Strachan family (Paul and Roser), the cruise was set up in 1998 after Paul revived the Irrawaddy Flotilla Company (IFC) when he leased and restored an original Clyde-built steamer called the “Pandaw” in Myanmar. Concluding chapter: File photo of RV Orient Pandaw cruising on the Rajang River near Kapit. The cruise operation was later expanded to the Mekong River in 2003, and to the Rajang River in 2009. Since its inaugural voyage on July 1, 2009, more than 2,000 tourists had joined the popular “Into The Heart Of Borneo” cruise throughout its two-and-a-half year operation. IFC through its Pandaw newsletter in November last year, however, had announced that it would discontinue the cruise on the 640km Rajang River in April this year, citing logistical and operational difficulties that made the project commercially unsuccessful. Sources familiar with the cruise earlier said costs to operate RV Orient Pandaw were 60-70% higher than those in Myanmar, Vietnam or Cambodia. 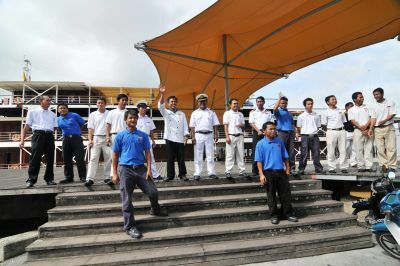 Saying good bye: File photo of Pandaw’s crew waving goodbye to foreign tourists leaving the boat at Sibu. The same sources also claimed that a longhouse here would charge up to RM3,000 for a three-hour programme, which included cultural performances, sampling of traditional food and rice wine as well as photo-taking session. In comparison, tourists are free to visit villages along the cruise’s routes in Indo-China. RV Orient Pandaw has been operating with a crew of 25-28 members, most of whom are from Myanmar because the locals prefer working in the timber, plantation, oil and gas as well as construction industries. It is also understood that the busy Rajang River also poses a number of challenges for the cruise boat as it is particularly risky to sail at night or in early morning when visibility is poor due to heavy mist, and also when the river is strewn with floating wood debris. A reputable local tour company with a good local and international network is already planning to build a new but smaller cruise boat with about 18 cabins to take over RV Orient Pandaw. The new boat is estimated to cost around RM5mil-RM6mil and takes less than two years to build.